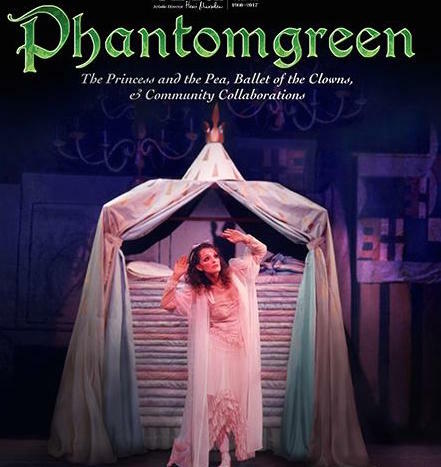 The State Ballet of Rhode Island welcomes spring as they present Phantomgreen Ballet Suite – based on the Hans Christian Anderson story The Princess & the Pea. This fairytale from your childhood, with its vivid music and humor, is a striking, balletic stage effect that has been enthusiastically received by audiences young and old! The world premiere of composer Margaret Buechner’s Phantomgreen Ballet Suite was given on May 12, 1990 by The State Ballet of Rhode Island with the original choreography of artistic director Herci Marsden. *What is the Princess and the Pea about? It involves a young woman whose royal identity is established by a test of her physical sensitivity. *Why the name Phantomgreen? A nightmare of dancing green peas prevents sensitive Princess Leonora from sleeping, which makes her a true princess. *How many mattresses did Princess Leonora sleep on? 20 mattresses! *How does Princess Leonora change from her dress to a nightgown and then into a wedding dress without ever leaving the stage? This you must see for yourself. *Along with The Princess and the Pea, audiences will be delightfully entertained with eclectic music along with classical and contemporary balletic works by a collaboration of choreographers. Saturday, April 1 at 12 noon before the 1:30 matinee. Ballet dancers will visit tea time, followed by on stage photo. Please call the SBRI Office @401-334-2560. Limited seating, reservation required. $20 per person. Light fare, tea, coffee and special sweets. Friday, March 31 at @ 10am – For ordering seats or questions to the 10am show, call SBRI @ 401-334-2560 for your seat reservation. SEATS WILL GO FAST! *Because people of all ages are touched by a theatre experience, SBRI has held the belief that people need to experience the arts in order to become aware of it and gain an appreciation for it.